An educational drumming book teaching the foundations of rhythm and trapset drumming. Improve your groove with the internationally acclaimed winner of the 2009 Modern Drummer magazine readers' poll for the Best Percussion Instructional Book for drummers. 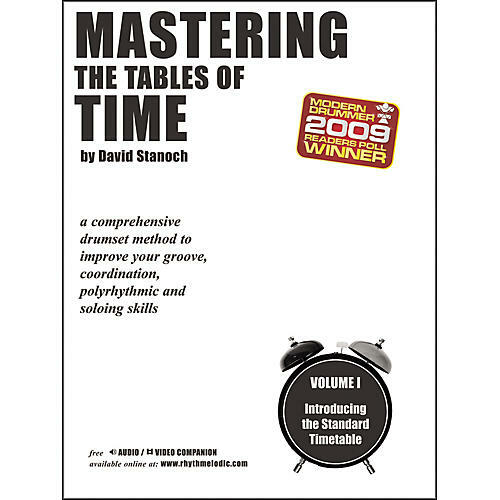 Dubbed "a future classic," this groundbreaking Mastering the Tables of Time book uniquely combines the foundations of rhythm and trapset drumming into a comprehensive method to improve your groove, coordination, polyrhythmic, and soloing skills. Includes a free link to an online audio/video companion.